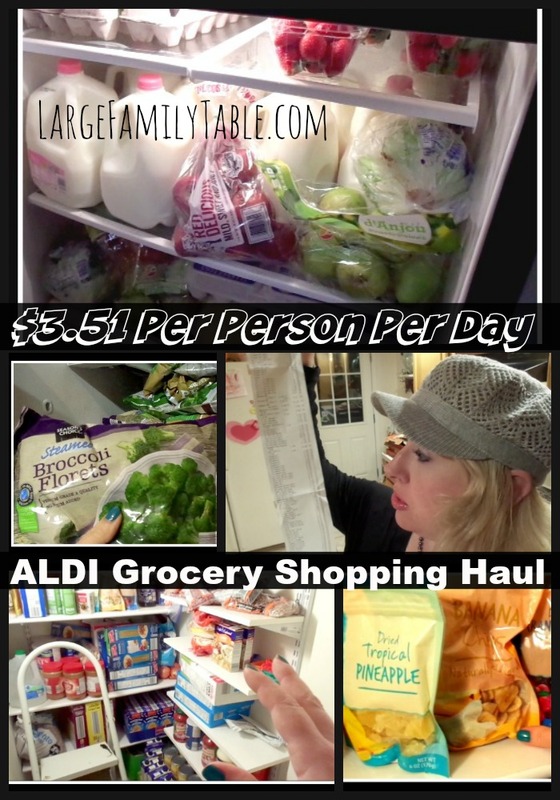 In today’s new Aldi grocery shopping haul for our large family, I spent $443 for two weeks. 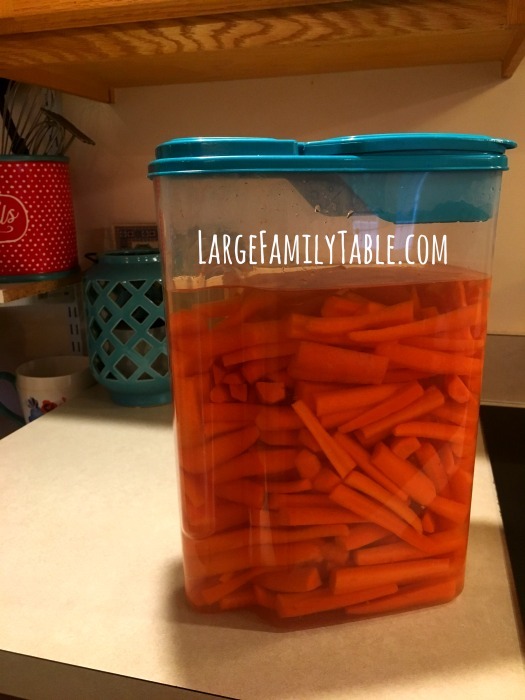 This includes 42+ full meals for our family of nine including teenagers down to toddlers, my husband, and my pregnant self. 🙂 This also includes about 30 snacks for nine over the next two week period. Additionally, I will push this grocery haul a few extra days past the planned out 14-days and eat down our pantry and freezers before the next shopping trip. The $443 divided by our family of nine who actually eat, breaks down to $24.61 per family member per week, just $3.51 per person per day. This haul does include some sanity/convenience items such as bagels and cold cereal that I don’t always get but need for ease during this exhausted pregnant mom season. I also picked up over 40 lbs of bananas, 20 lbs of carrots, 24 lbs of oranges, 12 lbs of apples, and more. Below you’ll find the full item-by-item cost breakdown and my entire large family meal plan for the next two weeks. 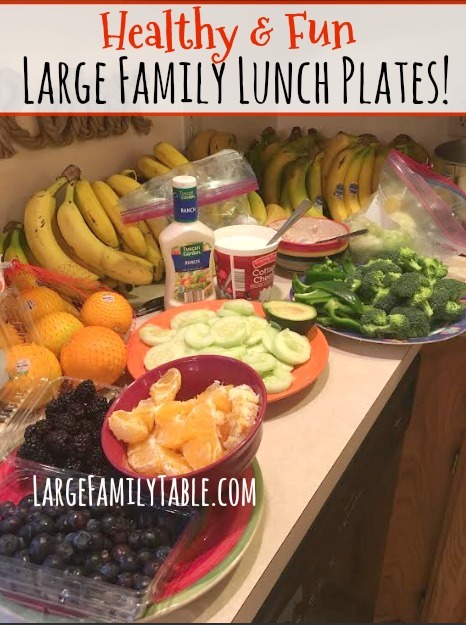 Fruit/Veggie Plates We love to set out all the available fruits, veggies, cottage cheese, etc. 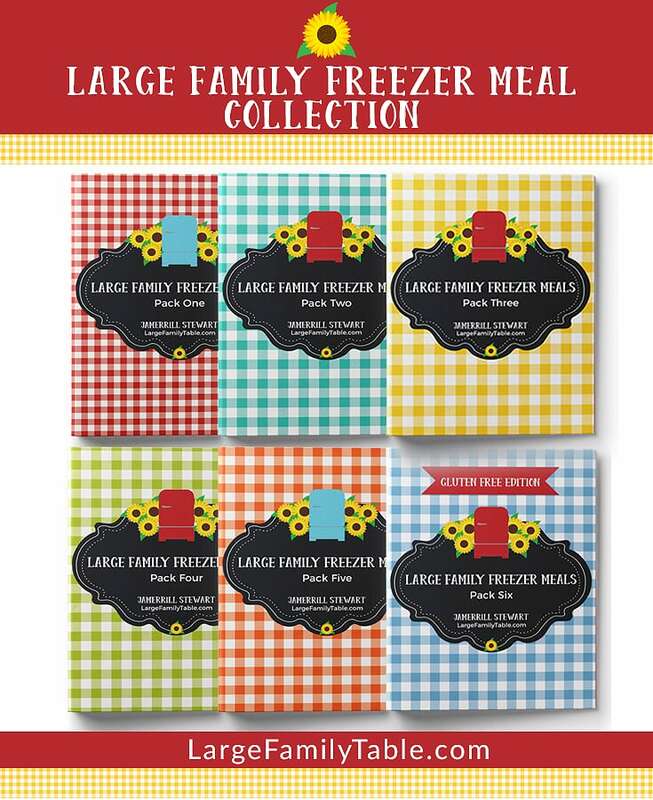 and make individual lunch plates full of everyone’s favorites. To do this though we need to have a lunch time at home without having to run out for errands. All dinners will be served with lots of fresh veggies. I also plan on doing roasted red potatoes like how I did here. 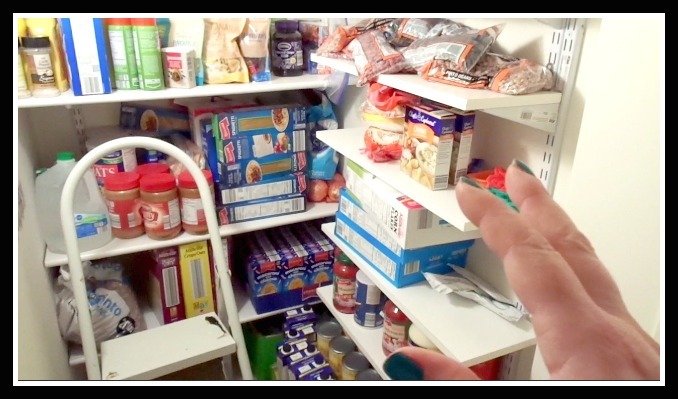 As I mentioned above, I’ll do some pantry challenge-type meals before I do our next big grocery haul. Also, several of these dinners below will carry enough leftover for lunch and/or dinner the following day. And momma’s let be real if this is what dinner looks like one night, more power to you! 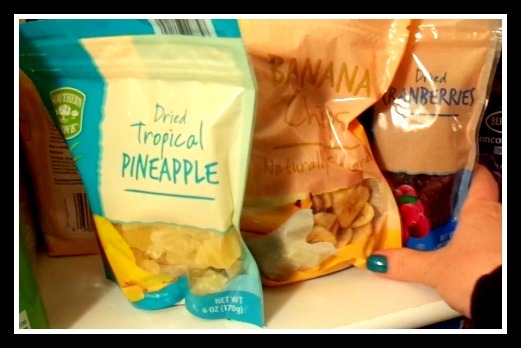 Click here to watch the full $3.51 Daily Per Person Aldi Grocery Shopping Haul | Hormonal, Exhausted, Pregnant Lady Edition! It’s always interesting to see what other people do. 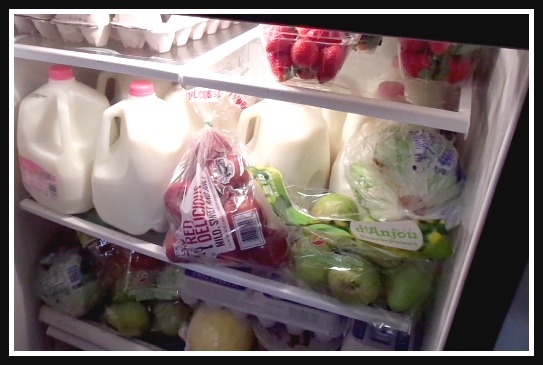 I once a month shop for our family of 6 and then pick up a few fresh things part way through. I have to say the prices you have are shocking. We live in Canada… and though we pay no taxes at all on food, basically if you quadruple almost everything you’ve got the prices I’m dealing with in the winter! Can you post your smoothie recipes, please? I am impressed. I have lots of questions for you! We’re in similar situations, in that I have seven kids and am pregnant again. I do most of my shopping at Aldi and believe our prices are roughly the same as yours (could have been different since you live in VA and I live in FL). How do you handle the expense of items like diapers, feminine hygiene products, shampoo, laundry detergent, etc.? If you add the cost of such items to the actual groceries, how much do you spend each month? My budget is larger than what you spend on food, but it includes things like diapers. I haven’t taken the time to itemize how much of my budget goes to groceries and how much goes to non-food necessities. I’m hoping I can follow your plan and bring down my expenditures a bit. Thank you for replying! I forgot to ask all my questions earlier. Are your older kids boys? I ask because I am now having to buy feminine hygiene products for four of us (yikes!). Do you have tips for where to shop or what to do to save money on those products? Also, I appreciate the honesty of letting us know you stopped for pizza on your grocery shopping day. I do the same sort of thing. 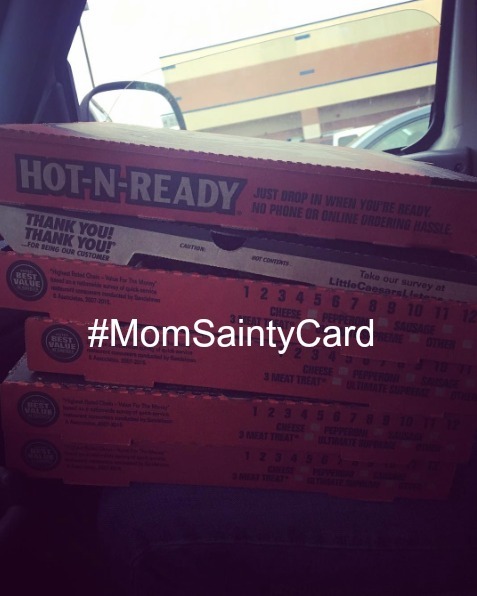 Do you count the cost of the pizza in yet another budget, or does it come out of your grocery budget? Oh, yes! And how many carts do you push through Aldi at once? Yes, our teens are boys. I’m not buying feminine hygiene products in bulk. Our oldest daughter is 10, and I’m always either pregnant or nursing for the last 17 years, haha. I have some friends with many girls, and several of them use diva cups (look those up on Amazon) or reusable pads. I don’t have a particular company to refer you to for the reusable pads, but it might be something you’d like to research. As far as the pizza, if I buy that on grocery shopping night, I figure that in with the grocery budget. On this particular grocery haul, I believe I didn’t buy pizza, but I bought the kids several boxes of mini donuts and those were within the grocery budget. The following day when we spent the day over an hour away at a friend’s house, I bought us 5 Little Ceasar’s pizzas on the way home. Those large pepperoni pizzas are $5/each, so I spent $25 out of my “running money,” to pick those up. That’s just pocket money I have for whatever unexpected may come up…like being far from home with nothing in the slow cooker for dinner and being exhausted, haha!